Back to working on my '57 for a bit. I have everything loose on the engine, except the exhaust, to lift it out. 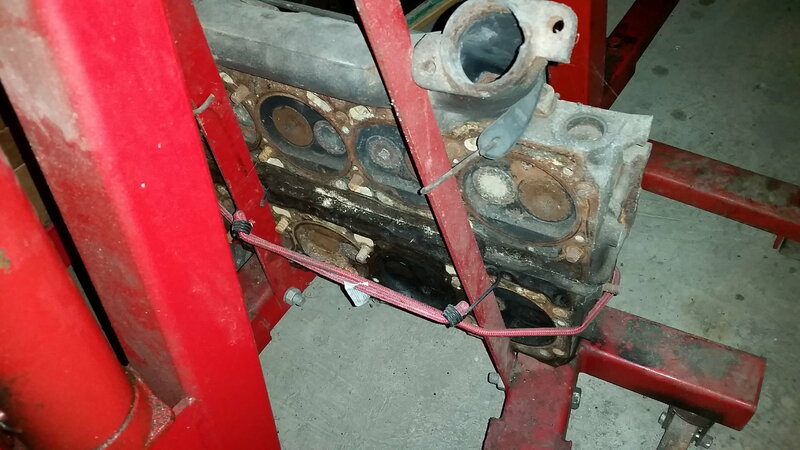 As I removed the upper bell housing bolts I was looking at the way it has to come apart, since the upper bell housing is part of the block casting, and started to think I made a mistake by not pulling engine and trans as a unit. The only info I found was in a old Motor manual. All it said was remove all front end sheet metal then remove engine. I did not remove sheet metal. Not to concerned about getting it out but think it may be a bear to line up going back. Thanks to all for your advise. Couple things to make it easier to remove engine and transmission together. Once everything is disconnected underneath, put blocks under rear tires and lower front tire pressure to lower front of car. Will not have to raise all that weight as high to remove. Think it's easier to take both out together. If there's the slightest chance the trans needs work, now is a good time to look into it if the budget allows. MAW category item to save removing it later to work on it. I did mine and it turned out it did need work. Then I put them back in together. If you are pulling the engine &transmission you might want to add extra weight to your picker for safety. I have a pair of J Heads, top has exhaust manifold still on it, for added counter balance. I've pull engine and transmission on 71-76 B/C bodies that have long front end using a lengthened picker boom arm, without any issues. that's as useful as a j head can be. No Tedd , first generation Olds engine weighs more than 700 lbs by itself . Cast iron trans weighs more than 200 lbs .